In an exploratory climbing expedition, Mirza Ali has taken this initiative and executed women expedition at Passu Peak from 18 July – 11 August 2017. Passu Peak is a strenuous climb and takes 30 days of grueling physical hardship to surmount the peak that includes training and acclimatization. This expedition demonstrated the huge potential for exploratory alpinism in this remote area. We’re aiming with the dream of encouraging and promoting adventure sports amongst women and aspiring to pave its way to Mount Everest in 2018, attempted by only a few brave hearts. Samina Baig the only woman who climbed Mt.Everest in 2013 and being the first Pakistani among men and women to summit the seven highest mountains in seven continent which are called “Seven Summits” including Antarctica. She was supposed to lead the expedition likewise; she led the winter expedition “Koh E Zamiston”. It was a cold winter day at Muhabatabad more or less 6km away from Shimshal village apposite the mighty Dastagir Sar Peak 7885m and Malanagudi glacier, the Home of Pakistan Youth Outreach Foundation Mountaineering camp, after brief chit chat ,Mr.Mirza Ali shared with Participants how he aims to take Pakistan women national team to Mt.Everest in 2018. This includes training and acclimatization, with an incredibly challenging terrain and temperatures. The training following a winter expedition was one of the project hidden planned however was not announced. The evening was cold but the emotions were warm and high also solid and strong! Komal Uzair from Sindh who also confirmed her participation in the training camp and later to Winter Expedition was first to raise her hand and said she would join the team for Mt.Everest 2018, following were three more girls. The team agreed and next plan was on the table, discussion was made and Mr. Ali the Expedition Advisor and Leader, mentioned Passu Peak (7478m) one of the training peaks before heading to Everest, after consulting with his lead guide Jalal who was on the Peak back in 2011 with Iranian women team, Passu Glacier has the feature off so the famous Khambu Ice Fall, which would offer great training before going to Everest. Fund raising was hence a major challenge; the worry was mounting as we were getting closer having no sponsorship. The fund raising team happen raised only USD 200 against USD 5000, The Expedition felt impossible on many fronts. One after another girl sent their inability messages due to non-sponsorship fund. 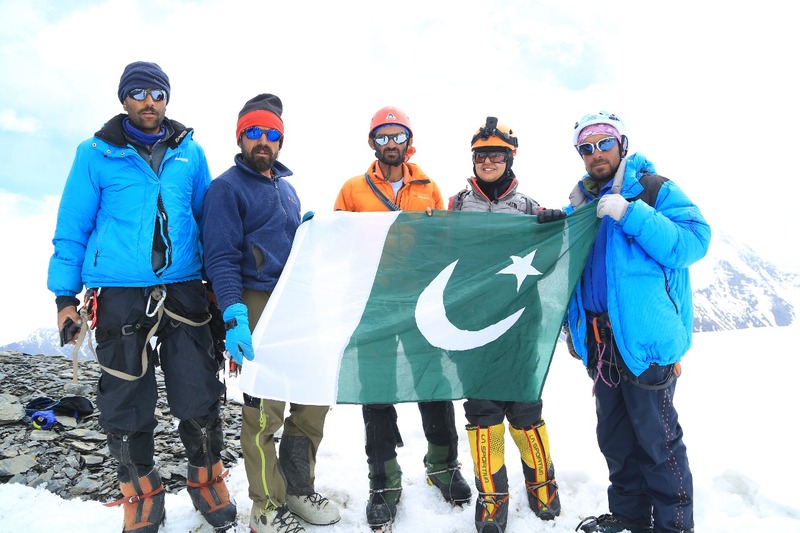 Only Komal Uzair assured her participation irrespective of sponsorship, she financed herself and hence once again sticks to her words; losing other girls was yet another challenge would we call it National Women Expedition if there was only one girl? No!! Another decision was made instantly, Mr. Mirza made an open announcement in Gojal Valley that he would sponsor two girls from the village in the women team if anyone is interested, many interested girls showed interest, The team selected two girls, 1st National ice climbing champion, 2016 and 2nd Position hold 2017 Samana Rahim and Sultan Amiruddin were selected. 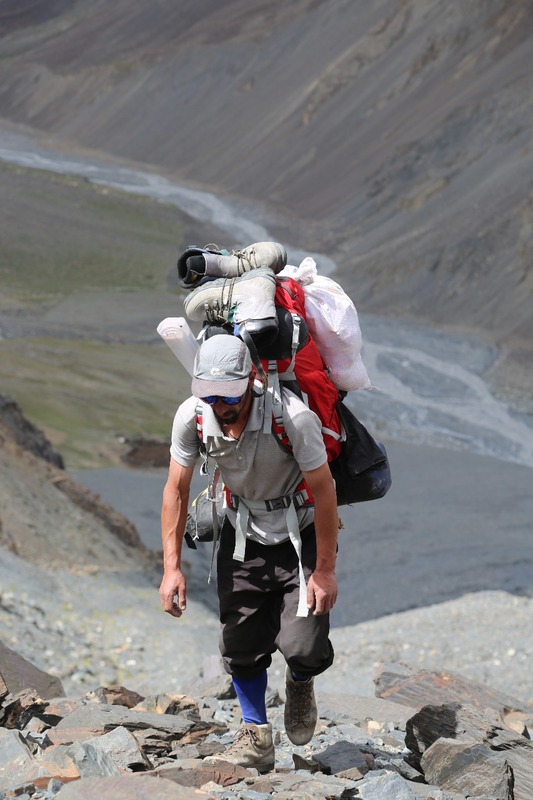 Logistical requirements such as applying for permits, organizing base camp equipment, arranging staff, porters, and their insurance, transport to/from the expedition area and Karakorum Expeditions had fulfilled countless smaller, but essential tasks. 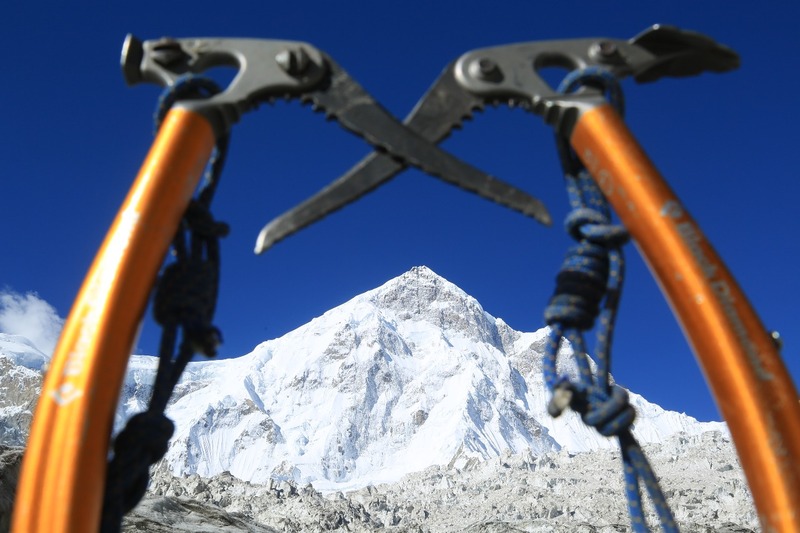 A specialist company based in Islamabad is essential for the provision of logistical services for any mountaineering expedition to Pakistan. 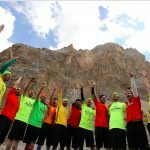 The team assembled at Passu village on 15th of July and toured both hanging bridge of Hussaini and Passu Village, the support team and the leader was on Nanga Parbat on a search and rescue Mission of the two Missing climbers. Mr.Mariano Glavan and Alberto Zarain, Argentinean and Spanish Nationals. The support team and two other expedition members Mr.Michael Pfiffer and Mr.Asad Ali joined the team, the expedition kicked in from Borith Village on 17th of July 2017, everyone was high on the sprite and excited. There were 52 porters in total were hired to carry the expedition gears up in the mountain. 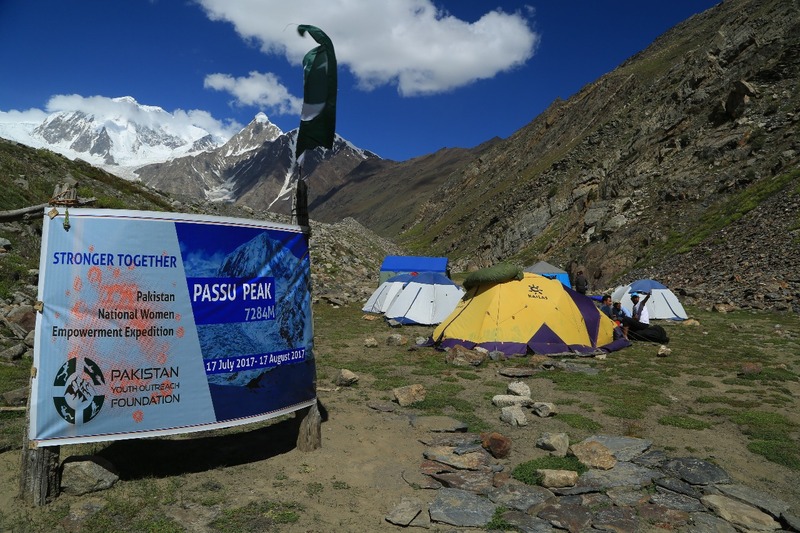 It was a bit surprising to counter as we were told the wage per stage to the base camp is double than any other place in Pakistan, Gilgit Baltistan fixes porter wage every year and that should be implemented all over Pakistan, yet the wage was double than the rest of the country! 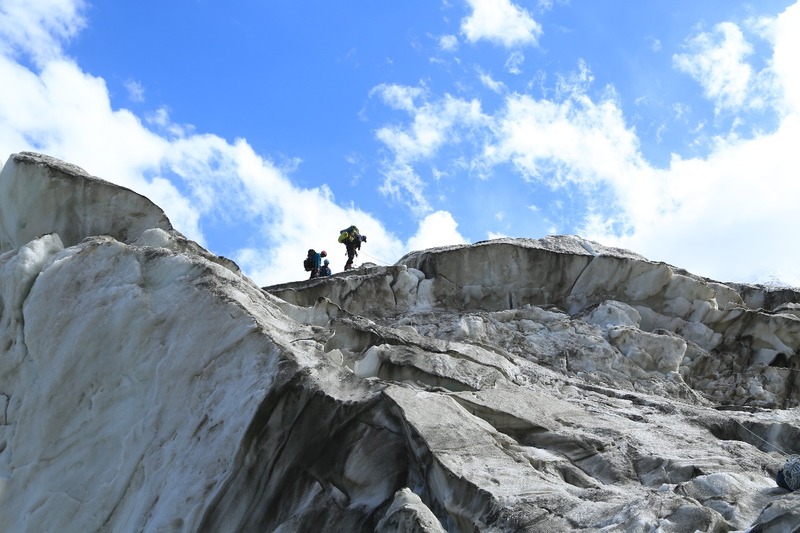 The team agreed without any delay to continue on the expedition, the march was in hot day moving along the Passu glacier was fascinating, the big cracks and giant crevasse made me wonder and concern and had the hope the upper part of the glacier is not as it’s here. The first day hike was merely 1:30hrs we camped at Passu-ghar despite late start, some of the porters insist to carry on to Lajdur and some resist , we were also having some luggage missing as we didn’t’ have sufficient porter to carry the entire load, some porters carried double and some did ferry . The night was pleasant but dust storm and dusty camp site with improper camping site made the night stay unpleasant. The interesting notice was having mobile coverage at the campsite. 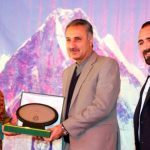 SCO special communication organization Network (SCOM) reaches higher places in the mountains as the sole provider of mobile service in the Upper Hunza valley. Some buzzing and mobile talks, the night was inevitable for rest. Morning start was quick since we had to reach base camp today, it was expected a total six hours walk and some strenuous uphill climb to Patandas. Crossing the glacier was quick and gentle with no much big cracks and cuts. On the other side of the glacier, some porters said, lunch should be served on the top of the hill and said Might having little of hope for the snow to melt to cook lunch, but it was not sure, so we relied on the glacier water and had Lunch at Lajdur. The heat was completely up with clear blue sky, the sun had no mercy and almost cooked all those starts the uphill climb with a heavy load. On top of the pasture (Patanduas) it’s indeed a heaven, the surrounding view has no match, to the east the mighty Shimshal range. Exceptional view of Lop-gar Sar, Trivor Sar and the entire range till Koron Koh. The view at distance is epic to the west the glittering Shispar and Passu Peak was matchless. The hike through green and lush alpine pasture is eye soothing but the non-existence of water makes it a terrible place. The teams arrived at different pace and so the porters, tea was served, Ali Shah the chief cook and Aziz the assistant cook was active setting up the camp with help of team high altitude guides, the entire team gathered but the last was the team Leader, getting heat stock and non- availability of water in Patandus made the day hard for him, the color was pale and later lots of water, energy drinks and three times vomiting cleared the headache and vomiting, Komal being the guide for the day and mastered it with grace. The base camp is at the edge of the moraine and the high hill, splendid view of Passu and Shispar Peak, the water access is brutal and far. However, the flat and grassy base camp makes the stay enjoyable and great. The entire team was excited and curious about next moves on the mountain, during the trek to base camp, most the time eyes were stuck at the lower and upper section of the Glacier, which we named, Karakorum Fall, a serious jagged, popcorned glacier, we discussed and from distance it looked easy to get through, Jalal also discussed his previous expedition details when he was at the peak back in 2011 with Iranian women team, they scaled the peak successfully. First evening and rock fall from the nearest hill were worrisome and then the shout comes clearly, the guides saying “Ibex” we could see a huge herd of Ibex searching for water and possibly were going to the glacier for water since Patandus doesn’t have any stream or snow line for animals. Thus we had great evening sighting of ibexes running just few hundred feet above our base camp. Next two days were rest days, some went washing and some did sightseeing, few went to make phone calls from Patundas, Michael hiked up to 4600m, during the night we looked at the pictures he took from the ridge and had a prospect of the glacier, zooming in and out couldn’t give us clear picture, the crevasses looked stable and easy we concluded. 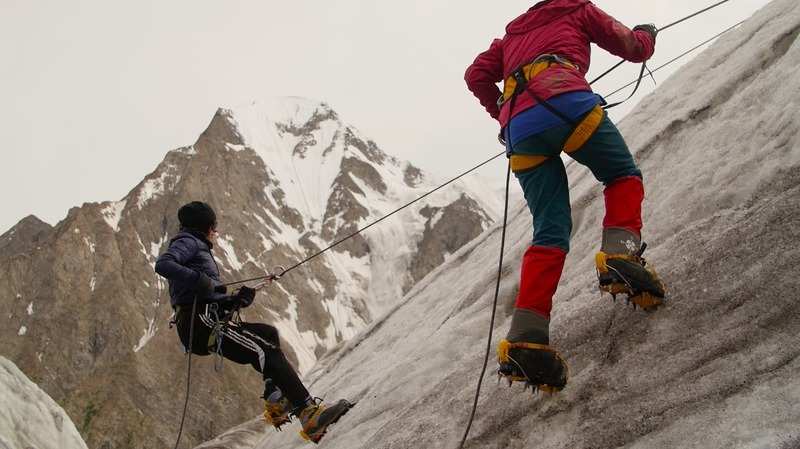 After a rest day, some ice practice was performed at the Passu glacier, the glacier reflection during the practice was a bit wild and rough, the girls did so well and during the training session jumaring, rappelling and other techniques of climbing were taught to the girls. All felt relax and happy, always fun to test and check the gears before heading up to the peak. 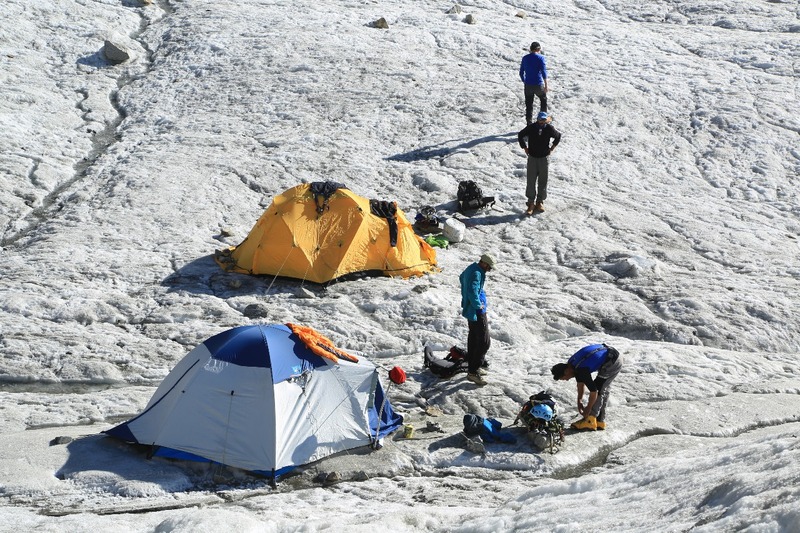 The guides moved up in the mountain to set up the Advance base camp, since the glacier route to camp 1 is quite distance through the hard glacier, the guides set up middle camp at the foot of the fall. 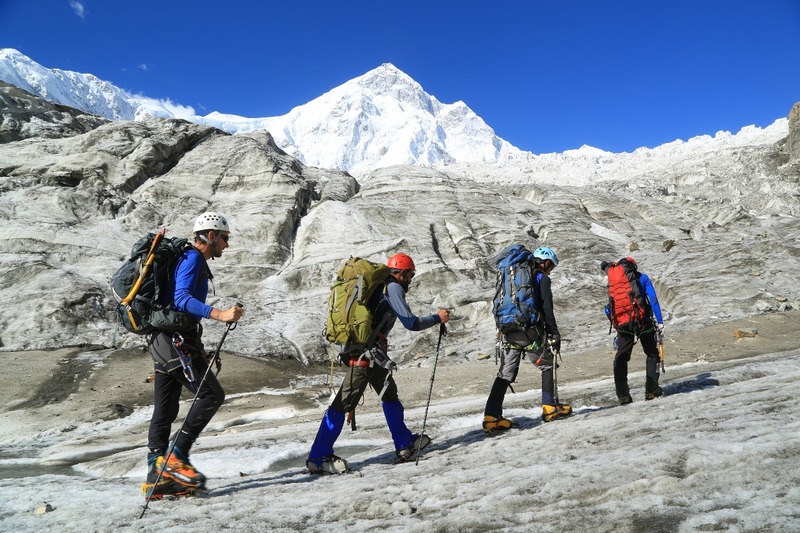 The next four days guides and the team climbed up to ABC (Advance Base camp) ferrying heavy loads for upper camps, which include, rope, tents, fuel and some food items. ABC is at the altitude of 4400m above sea level, the girls felt very fit but tiring day. From 24th July the guides set up to establish Camp 1, which sounds amazing and till camp 1 is the most treacherous on Passu Peak, sneaking through the broken glacier, Jalal, Eid, Arshad and Michael head out with all their belonging to Camp 1, first stop was ABC and then scouting and fixing rope the trouble parts to Camp1. They spent two and half days up in the mountain and radioed regularly with Base camp, upon investigating about the progress. It sounds very slow and their tune sounded the route is not moving ahead due highly broken and extremely fragile seracs, deep crevasse and hanging seracs, crevasse making the progress slow, by the evening Michael caught on Radio and said 600m rope been fixed and yet they reached 4500m and still a long way to Camp 1. 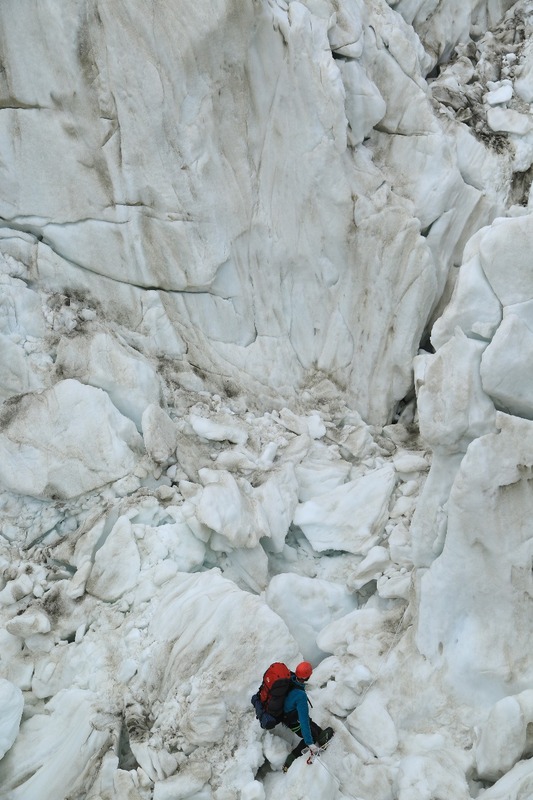 The glacier is extremely broken and large craves horizontally making pathway an absolute puzzle! The load carry from ABC to BC!!! Imaan who would supply and stock ABC was sitting at BC, Mirza and Imaan the next day, which was day three for the fixing team and 26th of July, marched to join the team and look through plausible route to Camp 1. The two met the team at ABC and then continued to Camp 1, the sun was up and the heat reached out the glacier earlier since its sun face and gets the sun early. Climbing through fragile and bottomless Seracs, crevasses the team reached midway, it was very dangerous seeing seracs collapse and the noise at one point raised the blood pressure high of Mirza as a leader and responsible for so many people was quite challenging. 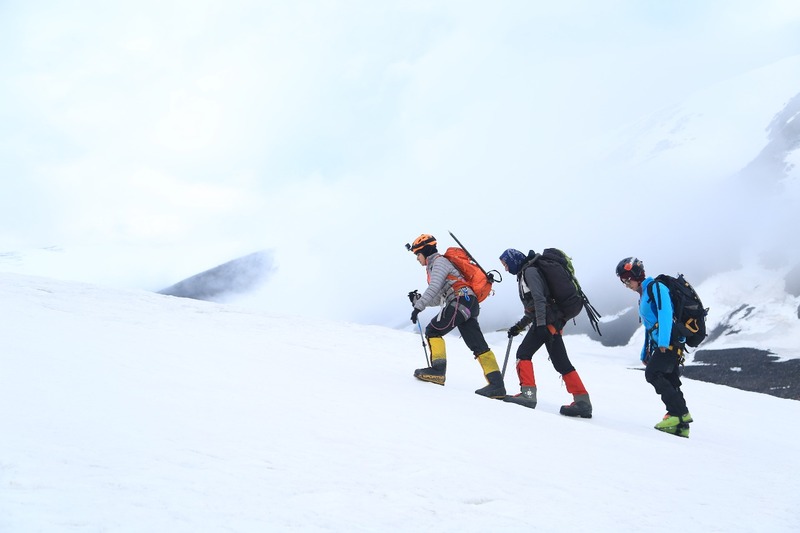 By Morning 10:30 am the team made it to the safe point and decided to stop climbing further since glacier melting would cause a hazard, opening and cascading of seracs was inevitable to any catastrophe. 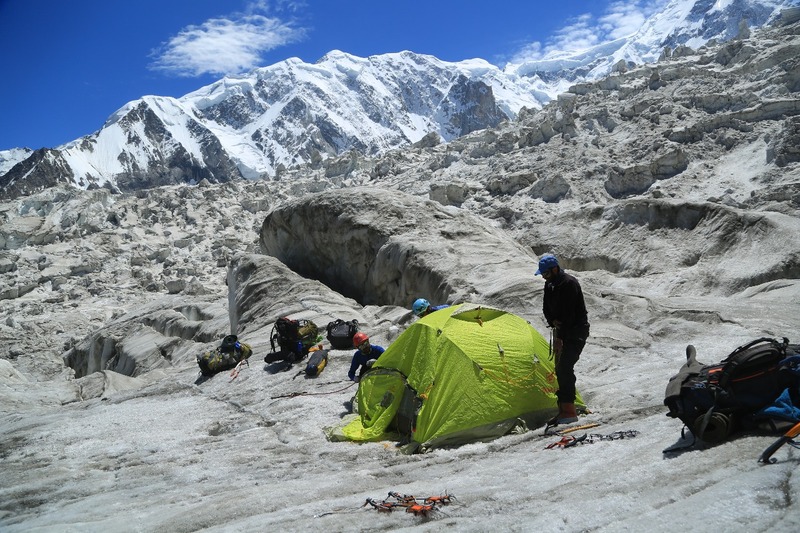 During the climb, the team had to replace all the anchor points those were put the day before, due to the high melting of glacier most of the anchors came out and getting up those need meticulous balancing in sheer steep walls, the camp was put in a safe place scouting the surrounding. Arshad prepared tea, the funny part was one of the propane gas caught in the fire, all of us just ran away and Eid and Mirza sheltered in water dripping from hanging serac and the others different direction, Michael and Arshad later put snow to extinguish the fire. As the canister didn’t blow off! After tea, Jalal, Eid and Imman went up to see a possible way to camp 1, after two hours or so they returned to our mid-ABC and Camp 1 Camp. The night was clear and interesting, lots of chit chat about morning, the team were high spirited and had hoped to get through the thick crevasse to camp 1. During the climb most of the time Mirza was worried about the upper section which looked more thick and jagged and a massive horizontal puzzle which indeed a real deal for the people and most importantly their safety. As Leader of several expeditions, I have learned, it’s extremely important to be successful but safety is beyond all success adopting the peaks, it was decided the team would move by 5 am, after some hot water, tea the team split into two groups. Jalal, Eid and Imaan on one safety and Arshad, Michael and I was on the other, the middle section was comparatively gentle slow and had still snow covered crevasses, making zigzag and walking back and forth finding escape between crevasses, the team reached the upper part, the middle section didn’t require fixed lines. 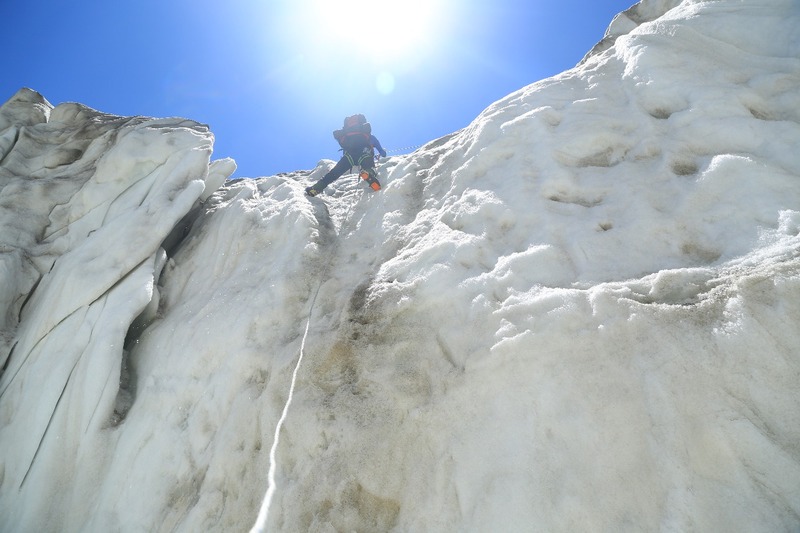 The upper section was searched a go through the seracs were attempted from the extreme left, Jalal leads the team and Eid on the belay, the large and wide crevasse. 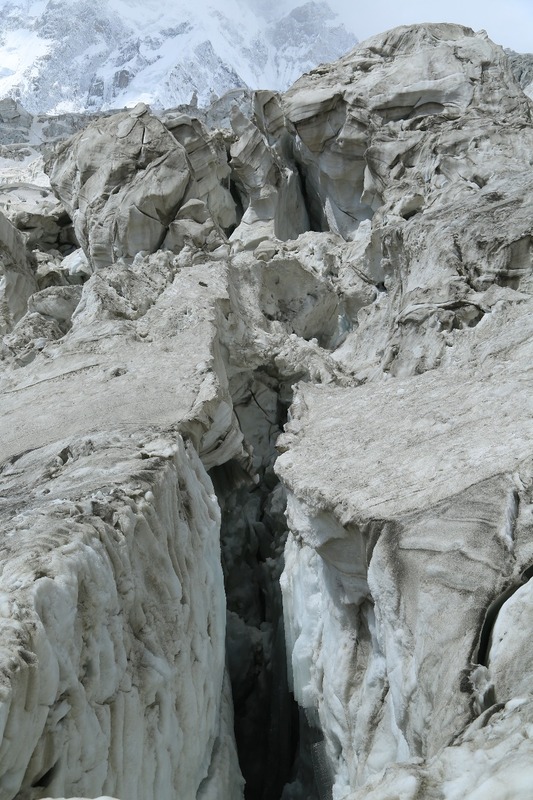 Loose, open crevasses across the glacier made it impossible to move to camp 1. The search from left ended to the far right to the rock part on the right. The team stopped had a discussion and then Michaels says, I think this is absolute. Not possible, the craves is extremely broken and there is no passage to camp 1, the entire portion below camp1 is not crossable. Upon this we further discussed, even if we put the risk high and move ahead what will happen in the next two weeks in the lower section, will more crevasses open and the route through which we climbed will get better or worse? Many discussions were required, the team radioed base camp and Michael explained to Komal the situation on the mountain, being so sensible she responded no risk if there is no way to camp 1, since it was the 4th day of the searching route above ABC. Jalal said, in 2011 they fixed the almost 125m rope to below camp, but this time, there was no way, despite we had more than 300m for the section. More discussion and then we decided to take the girls half way till our camp that we pitched for the night, the team returned to Camp, prepared tea and then head down to ABC. The 600m fixed line was entirely disturbed again, and most of the anchors were loose and unsafe, Jalal and Eid again went placing them. Securing the route, falling, breaking of the crevasse, seracs were routine, getting to the treacherous point, the team found out the main route between craves is almost gone. One small slab serac is proving a bridge to get over, with bags it was extremely dangerous since it was weak and the base was empty and deep crevasses, Jalal made it to the next anchor. Eid reached the BC and could not make with his bag; we put a rope across two seracs and supplied the bags avoiding the fragile bridge. One by one we got the bags on the other side, finding out the only route that was found after five hours of hard work two days ago is almost going to collapse, the team decided to cancel girls rotation to mid camp, Arshad and Imaan went back and put the tents down and closed the rope. 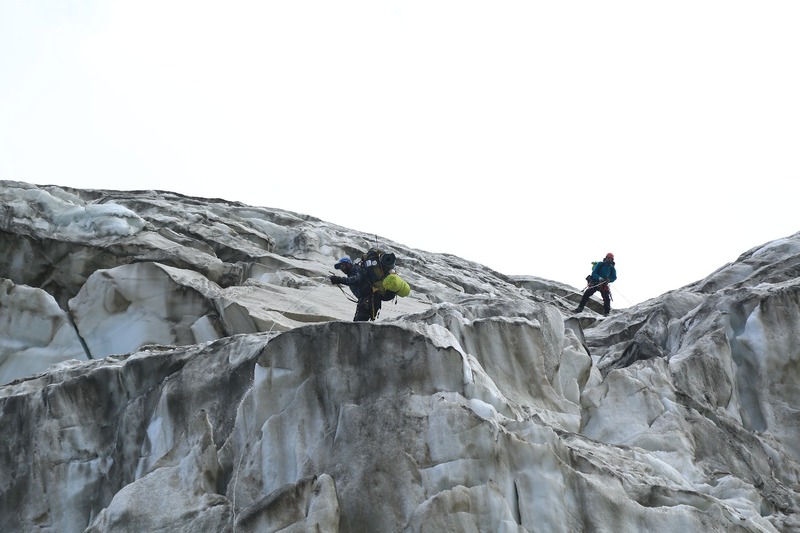 It was one of the most dangerous part passing through loose hanging seracs, collapsing constantly, reaching a safer point after hours, the team start the descent to ABC, at one point three of the members passed by a loose hanging serac, Imaan was about to pass the section when a huge chunk of Ice collapsed. 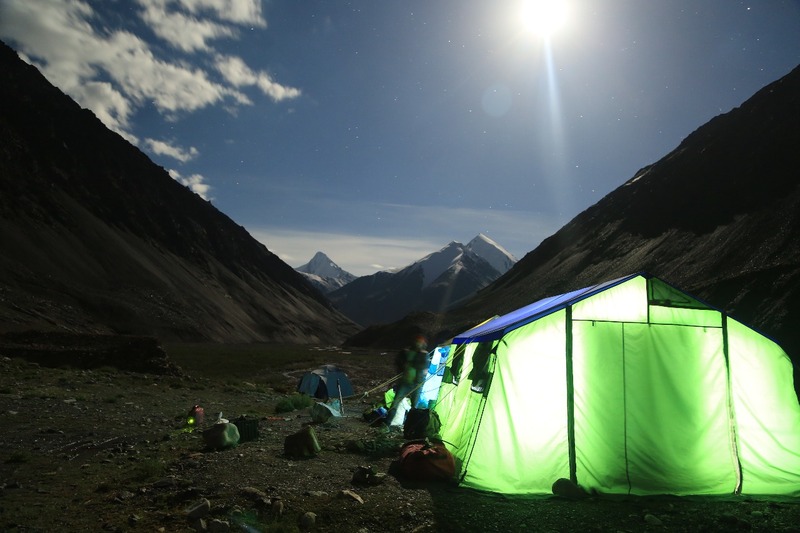 After 12 hours, the team reached Base camp, looked at the photographs and felt revealed getting through such part. 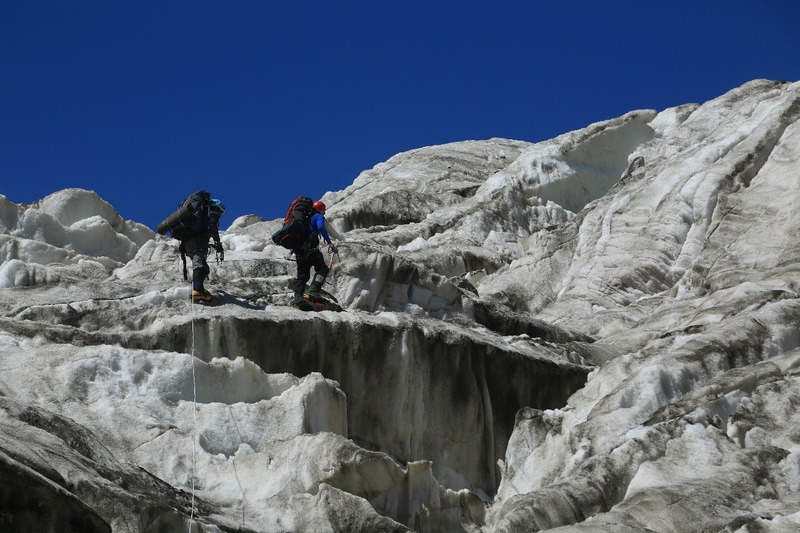 After dinner, the team discussed alternative since Pakistan woman team needed more training and basic training they did at the glacier but did not climb higher on the peak due to bad conditions. Mirza suggest to go to Shimshal and climb Koh-e-brobar (mt.Equality) 6008m high peak. In Gojrave valley of Shimshal, Mirza,Samina and three foreign climbers had first ascent back in 2011,the peak is strenuous and has easy access, all agreed and the team prepared going down to Passu, porters were called and then there was another bad news, due to high melting of glaciers, Shimshal river was flooding and washed out shimshal road and also foundation of a bridge that is connecting point to Shimshal Pamir and Gojrave valley. 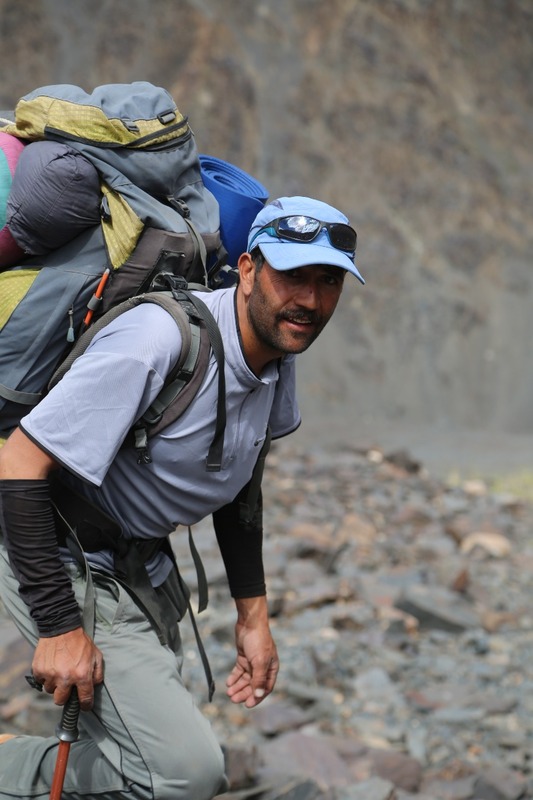 Having blacked and washed out the bridge for the Shimshal adventure the team gave up on the plan and discussed other options, Mirza suggests climbing a peak in Kuksil Area of Khunjrave pass, which had easy access. The suggestion was agreed and phone for a permit was requested for Michael, since Khunjrave is border area and restricted, every foreigner requires NoC or permit the Government to travel in the area for more than one day. Porters arrived everything was packed already, we had seven porters short to carry down the entire load, however, the important equipment was carried down the mountain, spending a night in Lajdur , the next day the team was in Passu. 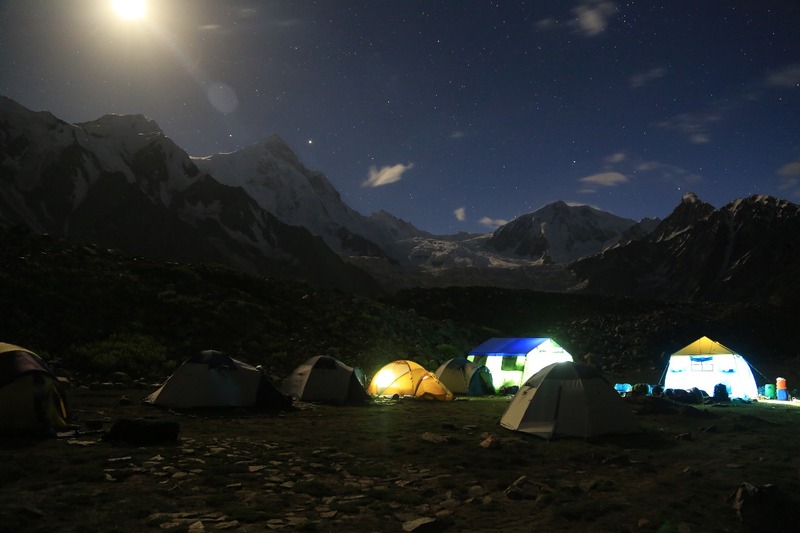 The Permit for Michael arrived via WhatsApp ,but next bad was coming, the team didn’t’ know that locals( Pakistani nationals) also require NoC to travel in the area, after a fine day the planned to drive directly to Kuksil and camp along the main Karakorum Highway. 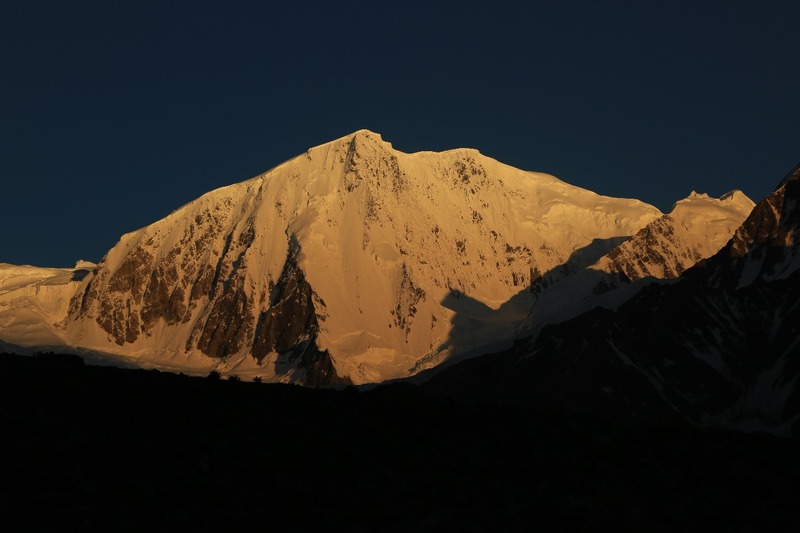 During the evening Michael, mentioned to Mirza, he is not interested to Kuksil peak, in the morning he said goodbye to all and left for Hunza, the team loaded the necessary gear and drove to Sost, on arrival at Sost a number of people came across and some acquired for NOC. One-person guide Mirza to an office, later found out it was KVO (Khunjrave village Organization) three members of the Organization came to the office and after the meeting. Mirza introduces himself to them, by the time, one nice well-dressed guy entered the office, upon introduction the discussion turned out to be smooth and nice, Mr.Rahman Posh introduce himself as honorary chairman of KVO. He also brief about KVO and its purpose projects the member along the chairperson then invites Mirza with his team for tea, a fine discussion following tea was served and group photos were made. Some security people mentioned to them that without NoC from DC/AC hunza, no one would be allowed to enter the area. This worried Mirza and request Amin in Aliabad to get the team NOC, the NOC was delayed and didn’t arrive the very day, in the evening. Arshad went to Aliabad to get the NoC signed from AC (Assistant Commissioner) or DC, Deputy commissioner Hunza, the signing prolonged due to non-availability of either officer, on 3rd Day. AC Hunza Anas Iqbal a fine young bureaucrat who was very helpful to the people and keen to get things moving faster. Signed the NoC, wasting three precious days in Sost town, the team left for Kuksil, at the entry point of KSF (Khunjerav Security force) an inspector under by the name of Hamid was also very friendly and cooperative, necessary entry the team moved ahead to kuksil. It was quite interesting that we were told that Locals need NoC, However, on the official paper, we found NoC is required only for non-Hunza people or outside Gilgit Baltistan. It was quite frustrating that we being the guardian of the border for seventy years, now we need NoC!! This is extremely disappointing and discouraging also, Since we live in the border and we don’t have any security force around and we the people are the protector and defender of our border, and also no any legal crossing incident happened in the area, also we were just going to put the green and white flag high on the mountains. Mirza at one point was very frustrated, said he traveled to seven continents to climb the seven highest peaks of seven continents, they didn’t’ have to go through such irritating situation that they came across in their own hometown! It is discouraging for tourism and outdoor it should be dealt nicely. The Koksil Valley was first explored by a Visser᾽s couple from Netherlands in 1925. After having crossed Chapchingal Pass, they headed southwards and, through Ghunjerab Valley, reached the Shimshal Valley. At present, this trail (with certain changes) is a trekking route recommended i.a.by the Lonely Planet guidebook. In the year 2000, a Pakistani guide Karim Hayat began a search of one of side valleys of the Koksil Valley marked on the Jerzy Wala᾽s map – Third Koksil Glacier. Up till now, he guided a few Austrian trekking groups to this valley. He also climbed several times a peak 5717 m (Jacky Chhish). Karim Hayat has organized our and Austrian expeditions in 2011 too. In 2003 the Third Koksil Glacerier was visited by Bernard Vaucher and his Pakistan friend Ishaq Ali. They reached the Peak 5,717 (Jacky Chhish) We reached this valley on 8th August 2011. The Austrian team led by Harry Grun had been active there for two weeks. The Austrians Markus Gschwendt on 4.8.2011 and Ulli Fechter and Birgit Walk on 6.8.2011 had already conquered Koksil Sar I (6,176meters). During our stay in the valley, they climbed two more almost six-thousand peaks: Koksil Sar II (Markus Gschwendt on 10.8.2011) and Koksil Sar III (Brigitte Hantusch and Klaus Adler). 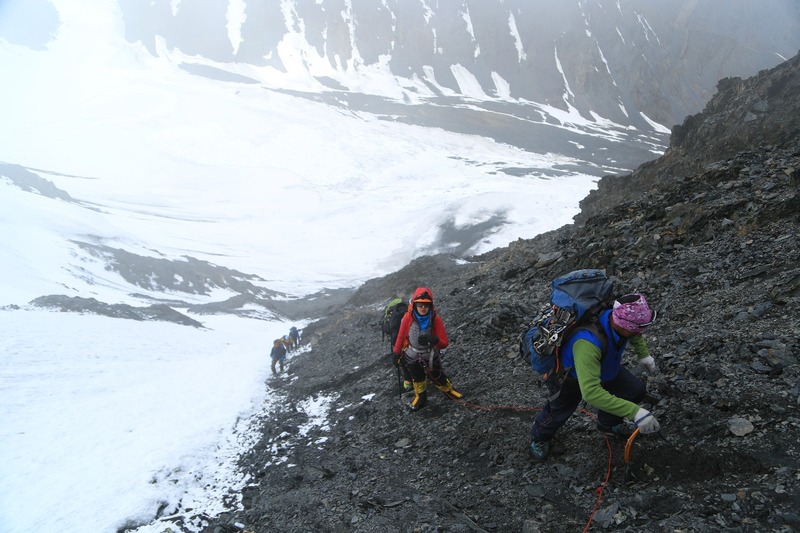 Women Expedition at Kuksil Sar Begins! The team setup the base camp, a fine view of the nearest mountains enticed for a quicker start. KNP people invite the team for tea, looking through their high definition binocular at the peaks that the team aimed to climb, Next day August 6th Jalal and Eid went for rekhi around the peak while other team members carried the load to high camp. On 7th August the team went to high camp with heavy load, 8th August was agreed to be rest day , and 9th August the team start the climb in the morning, the return time was set to be 10.30am, since during the night it rained heavily this turned rock fall and the snow condition could get worst, by 11 am the team reached 5500m not actually the main summit due to the bad weather condition we couldn’t made to the main summit which is 5800m high, Jalal and Eid fixed the ropes at the steep section to secure the route. 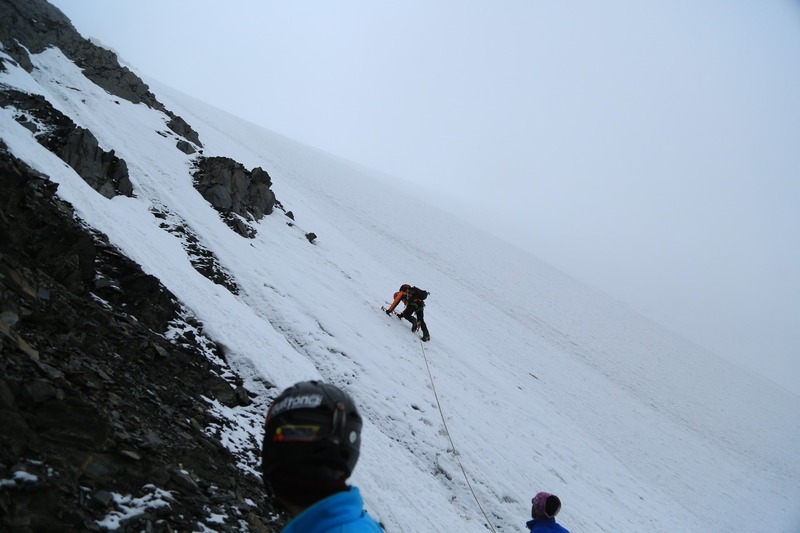 All three girls with the support team reached the peak, the face, in the beginning, was dry and prone to rock fall, did snow also during the climb. On the ridge at 5500m, singing of Pakistan national anthem was indeed a unique and unforgettable moment. A huge rock nearly missed the team by an inch!! We were fortunate!! the Jumaring and front pointing were a great experience for the girls, they purely enjoyed it and had fun, after taking picture and video, the team starts the descent, part of the training descent was also very interesting for the girls. The team safely reached the base and to the camp. The next plan was to attempt the next day another peak 5800m, however, in the evening massive thunder storm, lighting and then snowfall wrapped the expedition. The team main target was to reach the top of Passu Peak but due to unsafe conditions, the plan was the shift to Shimshal but Mother Nature was neither accepting the option and the road blockage made plan D. The enthusiasm of the team was invincible. The bonding among the member girls was amazing, they what physical, mental and emotional challenges mountain sports demands. The entire team had pleasant time despite the constant shift in the plans. The most interesting learning was that no one can challenge Mother Nature if you don’t listen to it. The local girls have the advantage of altitude and being born in the mountains, walking around regular in the mountains but Komal who comes from Sindh living in Dubai and coming to the mountains for brief time displayed high character and amazingly adapted the conditions, she learnt a lot technically and so mentally to face the hardship of mountain. To Conclude, This Training Expedition brought to a successful end by the teamwork of all the enthusiastic team members as a whole. They had a very strong and great team those who put great effort despite unfavorable conditions and lots of moving around the peaks and region. All of us lived this adventure at its best and we are making plans for the next adventure. Next adventure would be winter’s and later Next year some big plans if we are lucky with sponsorship. We hope and looking forward to individual and corporate sponsorship to carry the green flag high! More than just a Marathon!